We absolutely love photographing weddings at Barclay Villa. Rich with history and accented by stunning grounds, this European style castle venue located in Angier, NC is most certainly one of a kind. The bridal suite overlooks one of the two pools on the grounds, and provides beautiful window light for preparation photos. Preparation photos are one of my favorite times of the day, followed sunset portraits around the grounds. This photo was captured at sunset in front of the fountain at Barclay Villa. Dominika wore a beautiful long, flowing veil which we draped over her and Mark. 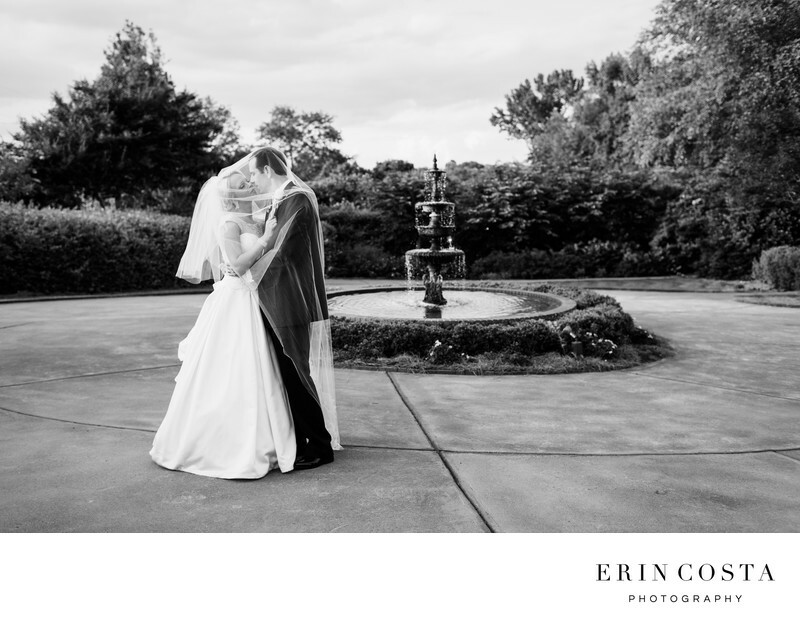 The black and white image makes this wedding photograph feel timeless which is how we want our photos to be remembered.